This right here is just what the missus and I always have needed -- dueling collegiate toasters. In the morning, she can have her inferior, bland Cornhusker toast -- the Big Ten effect, no doubt -- and I can smirk at her as I enjoy my stylish and much more flavorful LSU Tiger toast. All I need is to click on an Amazon button . . . and wait for the parcels to arrive. 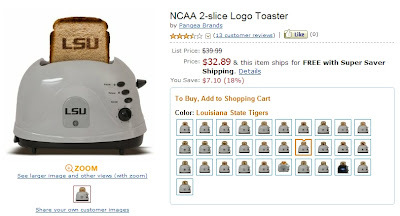 YOU WILL NOTE that the LSU toaster is more expensive than the NU toaster. My lovely wife likely will say that's due to kickbacks that have to be paid to somebody in the Gret Stet. That's because she slept through economics, not to mention many of her other classes at Lincoln. I attribute the price discrepancy to simple supply and demand. 3 Chords & the Truth: BOOM! Dear God. There was more out there. If Louisiana were capable of shame . . . If you can fake being sincerely annoying. . . .
Hell, no, we ain't all right! Dear God. There's more out there. It's a bird! It's a plane! It's a cat! A CAT!? !